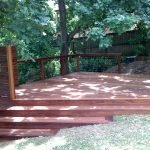 Maintaining your Sydney decking – Spring is here! Re-coating your Sydney decking is a job that most DIYers can easily tackle in a weekend. How often should you re-coat your Sydney decking? This depends on a number of factors, including exposure to the elements and how much foot traffic it gets. As a general rule, as soon as your decking finish starts to look a little tired and worn it’s time to do the job. Leave it for longer and there’s the risk your timber decking will become damaged and you’ll be up for a more difficult job. There are several finishes suitable for decking, including paint and stain, but the most common finish – and the one we’ll focus on in the article – is oil. If your decking is coated in another type of finish, read the directions on the back of your product before re-application. Before starting your preparation for re-application of decking oil, it’s a good idea to first inspect your Sydney decking. Look for worn or rotting timber, water stains and any spots that have sagged and get these issues fixed. Also, it’s a good idea to check for and hammer in, any raised nails. Then it’s out with a good, stiff broom for a thorough sweep of your decking. Following this, it’s best to clean your decking with a commercial decking cleaner. These products are purposely designed to remove the grime and oxidation that elbow grease and other cleaners won’t. Hose off to remove the residue and wait for your decking to dry. Decking oil can be applied with a brush or a decking applicator, a great option for larger jobs. Whichever you choose, make sure you liberally apply the oil along the entire length of your timber. Check regularly for any spots where the oil has pooled and back-brush if necessary. Two coats of oil is best and for many oils you don’t need to wait long between coats. So you might be able to finish the job in a day. For more tips on designing, building and maintaining a timber deck, go to our website (Decking Sydney) or phone us on 1800 601 674.